This article compiles all the official timelines and sources published by Blizzard into a non-exhaustive timeline of recorded important events in the Warcraft universe. This should not be considered as an official timeline but should be as accurate as, and more complete than, any timeline that Blizzard has provided. Numbering in this timeline is based on the opening of the Dark Portal, as this is the method used by the official sources. All dates are considered to be spans of time from one to the next since many events are only given vague ordering and estimated dates. Warcraft products are displayed in italics. Earliest known date. The creation of the Contents of Mosh'Ogg Bounty, determined through the use of a carbon-dating potion, and believed to be of Old God origin. Sargeras corrupts most of the eredar on Argus, convincing them to join his Burning Legion. With the help of the naaru, Velen escapes on the Genedar with other eredar that reject Sargeras' offer. The naaru name them the draenei, or "Exiled Ones". The trolls arise on primordial Kalimdor and establish their civilization, later forming the Empire of Zul to combat the aqir. The Aqir and Troll War ends with the defeat of the empire of Azj'Aqir, with the surviving remnants fleeing to form the colonies of Ahn'Qiraj, Azjol-Nerub and Manti'vess. The Curse of Flesh affects the Dragonflayer vrykul, causing their offspring (whose descendants would later become known as humans) to be born stunted and weak. The Curse of Flesh affects the mogu, who break apart into warrior clans and begin fighting amongst themselves in the Age of a Hundred Kings. Meanwhile, several new races — the hozen, jinyu and pandaren — settle in the Vale of Eternal Blossoms. The mogu Lei Shen seizes power from Ra and founds the mogu empire, enslaving the other races in the region. A tribe of dark trolls gradually migrate towards the heart of ancient Kalimdor and settle along the shores of the Well of Eternity. Over generations, the arcane energies emanating from the Well transform them into a new race of highly intelligent beings, who call themselves "kaldorei" ("Children of the Stars") or night elves. The kaldorei begin to actively study and practice arcane magic. They bend magic to their will and use it to build beautiful cities, craft artifacts and reshape the land. Some kaldorei resist the lure to use the Well of Eternity's power and warn others of the dangers of abusing it. Their warnings go unheeded. A group of upper-class kaldorei begin to refer to themselves as the Highborne and revel in the use of magic. Lei Shen attempts to invade Uldum and seize the Forge of Origination for his empire, but is killed when Uldum's tol'vir guardians activate the Forge's destructive power. In the process, Uldum's lush jungles are scorched into a harsh desert. Lei Shen is followed by a succession of various mogu emperors. The Highborne city of Eldre'Thalas is founded in Feralas by the Shen'dralar. Kang incites a slave revolution against the mogu, successfully overthrowing them and creating the Pandaren Empire. The Zandalari trolls, allies of the now-overthrown mogu, attempt to conquer a plot of land in Pandaria promised to them by Lei Shen. The invasion is repelled thanks to Jiang and the newly-founded Order of the Cloud Serpent. The War of the Ancients. Sargeras senses the Highborne's use of the Well of Eternity and decides to invade Azeroth. Corrupting Queen Azshara and her followers, a portal is opened through which the Burning Legion enters the world and lays waste to the night-elven civilization. Emperor Shaohao, the last emperor of the Pandaren Empire, is told of the impending invasion by a jinyu waterspeaker. After purging himself of his emotional burdens, he becomes one with the land and isolates Pandaria behind a veil of thick mists, which protects it from the war and ensuing disasters but also keeps it hidden from the rest of the world for millennia. Several night elves led by Malfurion Stormrage are able to destroy the Well of Eternity, preventing Sargeras from entering the world, and stopping the Legion's invasion. However, this also creates a massive cataclysm known as the Sundering, where eighty percent of Kalimdor's landmass is plunged between the waves, leaving only a handful of isolated continents. The Lunar Festival is created. The burgeoning night elf society expands into the dense forests of Ashenvale. Tyrande Whisperwind positions the Sisterhood of Elune as the leaders of the night elf government and military. The Sentinels are created to protect their emergent society. Malfurion Stormrage begins to train other druids. The War of the Satyr. The elves of Shandaral in Northrend unleash a disastrous spell during their fight against the blue dragonflight, cursing Moonsong Forest and turning it into Crystalsong Forest. Without permission from the Cenarion Circle, Fandral Staghelm plants branches from Nordrassil in Duskwood, Hinterlands, Feralas, Crystalsong Forest, Ashenvale, and the last one in Grizzly Hills in order to stop saronite from spreading. War between taunka and forest nymphs. The Grizzly Hills sapling quickly grows into Andrassil but is corrupted by Yogg-Saron. The druids are forced to fell the mighty tree, which is then renamed Vordrassil. Tyrande Whisperwind saves the frostsaber queen, Shy-Rotam, from the frostmaul giants. The frostsabers become allies of the night elves. The Curse of Flesh affects the mechagnomes of Uldaman, turning them into gnomes. They leave Uldaman for Dun Morogh, and forget their heritage. On Draenor, the arakkoa travel from Gorgrond to Arak. They create the Apexis civilization in their goddess Rukhmar's memory and begin to explore the world. Humans in the northern lands of the Eastern Kingdoms unite and form the kingdom of Arathor. They lend their help to the high elves of Quel'Thalas, and together they defeat the Amani trolls. In return for their help, the elves start teaching arcane magic to humans. The kingdom of Arathor expands, founding settlements in Alterac, Tirisfal Glades, Gilneas, Kul Tiras, and Dalaran. The reckless use of magic by humans draws the attention of demons from the Burning Legion, and they start manifesting in Azeroth. Mages from Dalaran form the Council of Tirisfal to secretly fight and contain the demons, without alerting the general population. The Council of Tirisfal finds a way to empower a champion permanently with their powers, in order to fight threats that the Council can't handle by themselves. Thus the office of the Guardian of Tirisfal is created, with Alodi becoming the first Guardian. Each new Guardian takes the mantle for a hundred years, before passing their powers to an apprentice. The dwarves awaken in Uldaman, migrating west and founding Khaz Modan. They establish the city of Ironforge and assist the nearby gnomes in founding Gnomeregan. On Draenor, Gnarlgar rallies the Primals against the Apexis and creates a new Sporemound known as Taala. The Apexis annihilate the Primal army with the Breath of Rukhmar, permanently destroying the Evergrowth and preventing it from ever returning again, leading to a golden age of mortal civilization on Draenor. The Gurubashi Civil War is fought between the Atal'ai Hakkari, followers of the loa Hakkar, and the rest of the Gurubashi. With help from the Zandalari, the Atal'ai fanatics are defeated and banished from Stranglethorn Vale. The human kingdoms of Lordaeron, Alterac, Gilneas, Dalaran, and Stromgarde are formed on continental Lordaeron, north of Khaz Modan. The kingdom of Stormwind (also known as Azeroth) is formed on continental Azeroth. The kingdom of Kul Tiras is formed off of the coast of Khaz Modan. After living hidden in Eldre'Thalas since the Sundering, Tortheldrin and his followers kill most of their Shen'dralar elven kin in order to hoard the demon Immol'thar's power for themselves. Most of the city is abandoned, and other creatures start moving in. The Apexis civilization is destroyed in a civil war. The Breath of Rukhmar explodes, shattering Arak's single spire into numerous smaller ones. The tauren inadvertently awaken the slumbering Princess Theradras, who drains the fertile lands of Mashan'she of energy, turning the region into a barren plain later called Desolace. Zaetar arrives to investigate but falls in love with Theradras, and from their union the centaur are born. After killing their father, the centaur proliferate across Desolace and begin hunting down the tauren, igniting a long and bloody war between the two races. Maraudon, the site of Zaetar's tomb, becomes treated as holy ground by the centaur. The ogres are taught arcane magic by the arakkoa and rebel against their ogron masters under the leadership of Gog Gronnslayer. The city of Goria is established, beginning the reign of the Gorian Empire. C'Thun and the qiraji awaken and attack Kalimdor. Fandral Staghelm leads night elves and dragons against the qiraji, pushing them back to the desert of Silithus. They are successful in sealing them within Ahn'Qiraj, but Fandral's son Valstann is slain in battle. Aegwynn, Guardian of Tirisfal, battles and defeats an avatar of Sargeras in the Dragonblight. She buries the remains of the avatar in the Tomb of Sargeras in the sunken ruins of Suramar. Sargeras' spirit, however, hides itself inside Aegwynn. Liu Lang defies Pandaria's belief that the rest of the world had been destroyed in the Sundering, and travels through the mists on the turtle Shen-zin Su. He returns every five years to bring more people along with him. Shen-zin Su grows large enough to become the Wandering Isle, with pandaren creating permanent settlements on his back. The orcs emerge from the subterranean caverns of Gorgrond and begin to spread across Draenor, forming various clans. Orcs from the Shadowmoon clan are taught the ways of shamanism by the elements and construct a temple at a site they name the Throne of the Elements. The biannual Kosh'harg festival is established. The Waygate between Sholazar Basin and Un'Goro Crater is activated for the last time until the war against the Lich King. Aegwynn decides to stay as the Guardian of Tirisfal indefinitely, partly due to her concerns about the Council of Tirisfal meddling with the politics of different nations, and partly due to Sargeras' influence. She builds Karazhan as her secret abode, but after the Tirisgarde find her, she moves to the Guardian Sanctum in sunken Suramar. Pridelord Karash of the Bloodmane saberon declares war upon the high arakkoa but is defeated by the Talon King Terokk. Terokk establishes the city of Skyreach but is later betrayed by the Anhari priesthood, who wish to retain sole control over arakkoan society. Terokk and his daughter Lithic are thrown into the Sethekk Hollow to become Outcasts. Lithic dies in the fall, but Terokk and his followers are guided by Anzu to create the talonpriests and establish the city of Skettis. Terokk eventually becomes insane and is sealed in a realm of shadow by his followers. The high elven Farstriders are officially formed. Imperator Molok of the Gorian Empire sends an ogre army to claim the Throne of the Elements and the power of the elements by force. The dissonance between the ogres' reckless arcane magic and the lingering power of Grond's remains creates an explosion that blows apart the orcish temple, leaving behind only a few standing stones and throwing the elements into disarray across Draenor. At the Kosh'harg festival, the orcish clans band together to combat the ogres at the urging of Nelgarm. The orcs lay siege to the ogre capital Goria. Molok and his sorcerers create the red pox, which begins to spread among the orcs, but Nelgarm and his fellow shaman convince the elements to completely destroy Goria. The last gnome king, King Mechagon, leads his followers in search of a mystical land of technology. Last reported case of a genesaur birth on Draenor prior to the creation of the Blooming Genesaur. A group of tauren founded the order of the Earthen Ring to lead their people with wisdom and maintain the harmony between the elemental spirits. The War of the Three Hammers. After the death of High King Modimus Anvilmar, the Bronzebeards, the Wildhammers and the Dark Irons start a war over control of Ironforge. The Bronzebeards eventually win; the Wildhammers relocate to Grim Batol, while the Dark Irons become enslaved by Ragnaros under the newly-created Blackrock Mountain. The draenei crash-land on Draenor in the Genedar and create the Council of Exarchs. The draenei establish Shattrath City in the location where Goria once stood. Auchindoun and the Auchenai are established after it is discovered that the remains of the naaru D'ore are attracting the souls of deceased draenei. The Temple of Karabor is founded. The Shadowmoon orcs begin to worship the darkened naaru K'ara as a deity, calling it the "Dark Star", but quickly outlaw the practice after discovering that wielding the Dark Star's power causes insanity. The naaru K'ure begins attracting the souls of deceased orcs to the wreckage of the Genedar. Orcish shaman begin making pilgrimages to the site to commune with their ancestors, naming the crystal mountain "Oshu'gun". A group of orcish exiles dwelling below Nagrand begin tapping into the Void energies bleeding from K'ure. This allows them to use shadow magic but also turns their skin a sickly white, causing the exiles to begin calling themselves "the Pale". The goblins of Kezan, granted heightened intelligence by the kaja'mite ore, break free of their slavery under the Zandalari and establish various cartels. Imperator Hok'lon leads the Gorian Empire in an attempt to retake the ruins of Goria from the draenei. The attack is easily repelled by the draenei and Hok'lon is killed. The ogres flee after Velen appears on Shattrath's ramparts, wreathed in light, and tells them that they will be allowed to leave unharmed. The orc clans debate over how to respond to the draenei. The Bladewind clan begin raiding draenei caravans, but the attacks gradually cease when the draenei send Vindicators to guard the caravans. A small group of high elves leave Quel'Thalas and travel to Winterspring in search of the mysteries of Kel'Theril, but end up discovering shards of the shattered Crystal of Zin-Malor. The expedition leader, Archmage Maenius, is corrupted by the shards and drives the elves to madness. King Barathen Wrynn of Stormwind defeats Garfang and his gnoll armies in the Gnoll War. For events taking place in the alternate Draenor timeline in Warlords of Draenor during this period, see the Warlords of Draenor section. Aegwynn and Nielas Aran conceive Medivh. Aegwynn hides the power of the Guardian of Tirisfal inside him, to be activated when he reaches maturity. Sargeras' spirit, which was hiding inside Aegwynn, possesses the infant. On the eve of his fourteenth birthday, Medivh's dormant powers awake and lash out, killing his father Nielas. Medivh lies dormant for many years after this, tended to by clerics at Northshire Abbey. Medivh awakens from his coma. The Gurubashi trolls begin launching raids on human settlements in retaliation for the humans pushing farther and farther south into Gurubashi territory. King Barathen dispatches soldiers to intercept raiding parties but forbids them from striking into Gurubashi lands. After a gruesome attack on three Westfall towns by the Gurubashi, Medivh and his two friends Anduin Lothar and Prince Llane Wrynn sneak into Stranglethorn to assassinate the Gurubashi leader, Jok'non. They succeed, but only after Medivh unleashes his full might as a Guardian. The Gurubashi rally under Jok'non's son, Zan'non, and march to war against Stormwind, launching an attack on Stormwind City itself. Barathen dies during the battle and Llane is forced to convince Medivh to unleash his full Guardian powers to repel the attack. Llane, Medivh and Anduin are hailed as heroes by the kingdom. Medivh is confronted by his mother Aegwynn at Karazhan. She urges him to isolate himself from the world and leaves him with a caretaker, Moroes. The Council of Tirisfal discover Medivh and begin sending apprentices to study under him, but none last for longer than a day. Moroes notices Medivh's ever-darkening mood and convinces him to begin launching banquets and feasts to lift his spirits. Two young orcs, Orgrim Doomhammer and Durotan, are saved from an ogre by a group of draenei. The draenei invite them to the nearby settlement of Telmor, where Velen requests an audience with them before the two orcs are escorted back to the borders of Gorgrond. Talgath discovers the draenei civilization on Draenor. Kil'jaeden commands him to observe the inhabitants of the world for the time being. Talgath observes the customs of the various major orc clans. The orc Gul'dan is exiled from his clan and seeks out the Throne of the Elements, where the elements reject him. Kil'jaeden reaches out to him and grants him the power of fel magic in exchange for agreeing to help the Burning Legion manipulate the orcs against the draenei. Gul'dan accepts, becoming the first orcish warlock. Gul'dan inundates the Throne of the Elements with fel magic, throwing the elements into disarray across the world, and also uses his magic to create the worst outbreak of the red pox in orcish history. Many orcs contract the plague at the Kosh'harg festival. Under the leadership of the Frostwolf chieftain Garad, the plague bearers establish a village in Nagrand to quarantine the afflicted. The village is named Garadar in Garad's honor after he succumbs to the pox. Medivh continues to study demonic lore and Azerothian history and becomes convinced that the world is inherently flawed, too divided by petty rivalries to ever unite into a single force in case of a demonic invasion. He concludes that he needs an army to change things and begins venturing out into the cosmos, eventually discovering Draenor and the orcs. Gul'dan returns to his home village and burns it and everyone within it to ash to prevent anyone from learning about his past. He then ventures to the Shadowmoon clan and convinces them to let him join them, claiming that his home village was destroyed by ogres. Gul'dan wins the friendship of the Shadowmoon chieftain, the shaman Ner'zhul, allowing Kil'jaeden to begin manipulating Ner'zhul's thoughts. Gul'dan manipulates the Bladewind clan into launching raids on draenei caravans, killing and kidnapping dozens of draenei. Vindicator Maraad and the draenei retaliate and storm the Bladewind village, but when Maraad sees the corpse of his sister Leran he goes into a rampage across the village. Gul'dan kills the few surviving Bladewinds as they attempt to flee. He then returns to the Shadowmoon and tells of how the draenei launched an unprovoked massacre against the Bladewinds. Meanwhile, Kil'jaeden appears to Ner'zhul in his dreams, disguised as the spirit of his deceased mate Rulkan, and tells him that the draenei are planning to destroy the orcs. Ner'zhul calls for a clan meeting at Oshu'gun, where the orc chieftains agree to band together to defeat the draenei, marking the creation of the Horde. The orcs begin launching sporadic attacks against draenei hunting parties. The draenei, assuming that the orcs have simply been agitated by the elemental turmoil, begin organizing and constructing new defenses. Ner'zhul's apprehension about the war with the draenei grows. Kil'jaeden appears to him in the form of Rulkan and tells him of powerful beings who could aid the orcs, and the night after Kil'jaeden appears again as a radiant elemental entity and urges him to push the Horde to victory and exterminate the draenei. Ner'zhul secretly embarks on a journey to Oshu'gun to seek the guidance of the ancestors, but Kil'jaeden is aware of his plans and tells Gul'dan to gather allies to control the Shadowmoon, since Ner'zhul can no longer be relied upon. Gul'dan recruits Teron'gor and several other shaman and begin teaching them fel magic. At Oshu'gun, the real Rulkan and the other ancestors tell Ner'zhul that he was being manipulated by Kil'jaeden and condemn the shaman for having been used by the demon lord. Ner'zhul falls into despair and is captured by Gul'dan's followers, who treat him as little more than a slave. Displeased by the disarray and infighting in the Horde, Kil'jaeden commands Gul'dan to find a single, true leader for the orcs — a warchief. Gul'dan convinces Blackhand to take up the position after training some of the Blackrock clan's shaman how to wield fel magic and magically age young orcs, including Blackhand's young sons, Dal'rend and Maim. Gul'dan forms the Shadow Council to watch over the orcs and includes Blackhand in the organization, but Gul'dan's trusted Shadowmoon warlocks secretly form the inner circle of the organization. The warlock recruits new members for the council, including Cho'gall and Garona, and creates a group called the necrolytes. Zagrel, Chieftain of the Whiteclaw clan, is assassinated by Garona on behalf of Gul'dan for speaking out against the Horde. At a clan meeting at Oshu'gun, Gul'dan persuades many shaman into becoming warlocks and convinces the clan chieftains to unanimously vote for Blackhand as their warchief. Blackhand orders the construction of the Citadel, later known as Hellfire Citadel, and organizes the various clans into specific roles within the Horde. He also forms a new clan known as the Black Tooth Grin and names Eitrigg, Orgrim Doomhammer and Varok Saurfang as his lieutenants in the Blackrock clan. Blackhand sends warlocks to magically age the adolescents of other clans. The orcs' skin begins to turn a sickly green. Cho'gall recruits the pale orcs into the Horde and forms the Twilight's Hammer clan. The draenei's morale begins to founder as the orcs launch coordinated assaults on minor settlements and outposts across the dying world. Velen and the exarchs, knowing that their only chance of survival is to hold off the onslaught and hope that the Burning Legion does not launch a full-scale invasion, order their forces to withdraw to Shattrath and Karabor. The elemental spirits pool their power into the mighty Firelord, Cyrukh, to stop the desecration of the land. The orcs gather for an assault on Karabor. Cyrukh appears in a nearby volcano to confront them, but Gul'dan and his warlocks gather on the volcano's slopes to shatter the being's physical form and infuse its power into the orcs, shattering the last connection between the orcs and the elements. The volcano becomes known as the Hand of Gul'dan. The draenei hold the orcish assault at bay for a time but are defeated when the Horde uses the power of the Dark Star to kill or drive insane many of the defenders and permanently darken Karabor, turning it into the Black Temple. Velen and the survivors manage to flee via the harbor. The orcs gather at a mountain near the Citadel and drink the blood of Mannoroth at Gul'dan's urging. Durotan forbids the Frostwolves from drinking after having received an anonymous message from Ner'zhul, while Orgrim refuses out of suspicion for the growing corruption of the orcs and Draenor. Those who do drink the blood are driven into a ferocious bloodlust and march against Shattrath as Gul'dan infuses the mountain with fel energy, transforming it into the Throne of Kil'jaeden. The victims of the red pox quarantined in Garadar remain isolated from the fel corruption, leading them to become known as the Mag'har, "Uncorrupted". Velen leads many Shattrath civilians to a refuge in Telredor. The orcs launch an assault on Shattrath, unleashing the red mist against the draenei. Before long, the city falls to the Horde. Many of the survivors retreat to Auchindoun. Teron'gor and other Shadow Council agents are dispatched to the mausoleum, but when they are repelled by the draenei and Auchindoun's spirits they attempt to summon a powerful demon to aid them. Instead, they accidentally summon Murmur, whose arrival blasts Auchindoun apart and levels the surrounding forests. The warlocks bind Murmur within Auchindoun to prevent it from wreaking havoc on the Horde. More draenei survivors arrive at Telredor. The ones afflicted by the red mist mutate into Broken, and the populace of Telredor exile them into the wilds out of fear that the condition might spread. Some Broken continue to degrade into Lost Ones. Blackhand turns his attention on Draenor's other inhabitants. Kilrogg Deadeye and the Bleeding Hollow clan launch a campaign against Farahlon, while Grommash Hellscream and Cho'gall topple Highmaul. Elsewhere, the Frostwolf, Whiteclaw and Thunderlord clans are charged with hunting down the ogres, ogron, gronn and magnaron, though only the Thunderlords obey. Kargath Bladefist leads a force to conquer the arakkoa capital, Skyreach. The orcs ally with the Outcast arakkoa, who agree to infiltrate Skyreach and sabotage the high arakkoa's superweapon. Kargath and his forces then slaughter high and cursed arakkoa alike, casting some of the former into Sethekk Hollow. These cursed high arakkoa rally under Grizzik, who leads his people to take refuge in Auchindoun. Kil'jaeden ceases to communicate with Gul'dan on Sargeras' orders. The orcs begin to flounder on Draenor as the world slowly dies. The threat of starvation causes the orcs to hunt many of Draenor's native creatures to extinction and begin fighting amongst themselves. Medivh appears to Gul'dan and the Shadow Council and tells them of Azeroth, as well as showing a vision of the Tomb of Sargeras to Gul'dan. The construction of the Dark Portal begins. The Horde enter the Dark Portal and small skirmishes break out with the humans. Rumors spread of monsters in the swamp; most are dismissed as tales. The Frostwolves are banished from the Horde and begin sneaking north to find a new home. Blackhand orders the Horde push north and west, far into Stormwind's territories. Many villages and towns are destroyed. The Bleeding Hollow clan pushes into Stranglethorn but are met with strong resistance from the Gurubashi, and eventually retreat. To combat the Horde, the Northshire Clerics begin entering the battlefield, the humans' first view of a priest on the frontlines. The Old Gods begin contacting Cho'gall and the Twilight's Hammer clan. Cho'gall agrees to follow the Horde, but only for his own motives. The Frostwolves arrive in Alterac Valley, having almost entirely avoided Azeroth's other races thanks to the elements. Shocked at their child's green skin, Durotan sends messages through the elements to meet with Orgrim near Loch Modan. The two meet to discuss this revelation and go their separate ways. Orgrim sends his most trusted friends with Durotan and his wife, Draka, for protection, but they turn out to be loyal to Gul'dan. They murder Durotan and Draka and leave Thrall for dead, but the infant is soon found by Aedelas Blackmoore. Redridge falls to the Horde. The Shadow Council moves their operations to Blackrock Mountain. The Horde begins their first siege of Stormwind. It's met as a stalemate and the Horde retreat. Garona is allowed entrance to Stormwind by the word of Khadgar, who warns King Llane about Medivh's fall to the Legion. Khadgar and Garona go to confront Medivh and a battle ensues. Sargeras' spirit, still inside Medivh, magically ages Khadgar well past his prime. Gul'dan sees the battle through Garona's eyes and frantically connects with Medivh, mulling through the Guardian's memories for more details on the Tomb of Sargeras' location. Khadgar slays Medivh and Gul'dan is put into a coma. The death of Medivh, whose body was still infused with fel, caused a catastrophic explosion, scorching the land around Karazhan into Deadwind Pass and turning Brightwood into Duskwood. Seeing the Shadow Council's weakness after Gul'dan's coma, Orgrim challenges Blackhand to a mak'gora. The duel ends in Orgrim crushing Blackhand's skull with his family heirloom, the Doomhammer. Garona and Khadgar return to Stormwind to inform Llane of the Guardian's death. In the battle, however, Gul'dan had implanted thoughts of killing allies into Garona's mind. These messages flared bright in her head once more, and she assassinates Llane. Stormwind comes under siege from the Horde and the front gates fall. The city falls to fire, and Lothar is forced to gather what refugees he can and flee north. Stormwind's refugees arrive in Lordaeron and the human nations plan their next move. The Horde gathers resources and plan their next conquest in pursuit of the refugees. The Demon Soul is found by orcish warlocks. Alexstrasza senses this and comes to investigate. The human nations form the Council of Seven Nations. Gul'dan creates the first death knights. The Horde pushes north, conquering Khaz Modan and trapping the dwarves and gnomes within Ironforge and Gnomeregan. Orgrim builds the orcish fleet in present-day Menethil Harbor, planning to sail around the Thandol Span and into Hillsbrad. Khadgar and Lothar assist in rallying the human nations into the Alliance. The Order of the Silver Hand is founded and begin training the first paladins. The Dragonmaw clan bind Alexstrasza in Grim Batol with the Demon Soul, forcing the red dragonflight to the Horde's will. Lothar calls upon an ancient pact, earning the assistance of the Quel'dorei in the war effort. The Horde sail north but are outmatched by the Kul Tiras fleet. Red dragons chase off the Alliance and the Horde make landfall. The Battle of Hillsbrad Foothills ensues, leaving much of the landscape in ruin. The Horde's death knights prove triumphant over the Alliance's paladins. The Horde frees Zul'jin from human captivity, who in turn pledges his tribe, the Amani, to the Horde's cause. Garona escapes capture from her handler, Eitrigg. Horde forces move through the Hinterlands, suffering attacks from the Wildhammer clan of dwarves. The Horde moves to Quel'Thalas and Gul'dan assists in dismantling the elven runestones, which he later utilizes to create two-headed ogres. With the assistance of the Horde, the Amani finally begin retaking parts of Eversong. The high elves are pushed back to the walls of Silvermoon, but fail to breach them. Orgrim realizes his resources should be pooled elsewhere and moves his forces southwest towards Alterac, leaving the Amani. Zul'jin would never forgive the Horde for this. Realizing the might of the Horde, Aiden Perenolde strikes a deal with the orcs. They will be allowed passage through Alterac if they spare his city. Orgrim readily accepts and moves on to Capital City. The Horde begins their siege of Capital City but is met with a strong opposition. Gul'dan, having finally learned the location of the Tomb, abandons the Horde with the Twilight's Hammer and Stormreaver clans, causing the Horde's loss in the Second War. Gul'dan raises the Broken Shore and makes his way through the Tomb. Defying Kil'jaeden's plan of turning the Tomb into a portal for the Legion, however, the warlock attempts to take all its power for himself. He and his followers are torn apart by monstrous demons while the rest of his clan is defeated by the Dragonmaw. Cho'gall and the Twilight's Hammer clan flee west to Kalimdor. The Horde flees south but is quickly followed by the Alliance, the Kul Tiras fleet and the Wildhammer clan. Khaz Modan is liberated and the dwarves and gnomes readily join the Alliance. Siege of Blackrock Spire - the Alliance lays siege to Blackrock Mountain. Orgrim slays Lothar in combat but is swiftly defeated by Turalyon and captured. Khadgar destroys the Dark Portal. Dal'rend and Maim Blackhand bolster Horde remnants at Blackrock, forming their "True Horde". Most orcs fled into the wilderness, travelling in small packs or alone. The Alliance begins the Orcish Internment. Aedelas Blackmoore is named lord of Durnholde and secretly raises Thrall as his slave. Nethergarde Keep is established to keep watch over the rift that still exists in the Blasted Lands. Ner'zhul reforms what little Horde is left on Draenor. In search of new worlds to conquer, Ner'zhul tasks Teron Gorefiend and the remaining death knights with acquiring artifacts of power; the [Scepter of Sargeras], the Eye of Dalaran and the Book of Medivh. Ner'zhul re-opens the Dark Portal with the Skull of Gul'dan. Deathwing pledges his flight to the Horde if they'll take a large number of his eggs with them back to Draenor. Ner'zhul agrees. Teron Gorefiend and the death knights retrieve all three artifacts and return them to Ner'zhul. The Warsong are tasked with preventing the Alliance from entering the portal, but are beaten back by Turalyon's forces, the Sons of Lothar. The Sons of Lothar invade Draenor, beating back the Horde to Hellfire Citadel. Ner'zhul flees south with the three artifacts to Karabor, now called the Black Temple. While searching for nesting areas, Deathwing and his flight come under assault from the gronn. The most ruthless, Gruul, becomes known as the Dragonkiller after nearly killing Deathwing himself. Ner'zhul uses the power from all three artifacts to call open innumerable dimensional portals. The influx of power tears apart Draenor into what it is today; Outland. Many orcs fled Draenor to Azeroth and most were captured. Khadgar, still on Draenor, closes the Dark Portal from his side, trapping the Sons of Lothar on a dying world. Cho'gall and the Twilight's Hammer arrive in Kalimdor and establish a base in a cave system beneath Tanaris, seeking to join C'Thun in Ahn'Qiraj. Garona begins assassinating members of the cult, eventually forcing Cho'gall and his followers to flee the area. Aegwynn uses her power to summon Medivh's spirit on Azeroth. Free of the taint of Sargeras, the Last Guardian decides that he will be the catalyst to unity and decides to warn the other races of the upcoming return of the Burning Legion. First Brewfest, organized as a beer-tasting contest between Chen Stormstout, Grimbooze Thunderbrew and Coren Direbrew. In Feralas, Cho'gall lures Garona into the open and magically enslaves her, turning her into his servant. The remaining Twilight's Hammer continue into Silithus to join C'Thun. The Forsaken join the Horde. Marvon Rivetseeker excavates the Broken Pillar in Tanaris. The Great Lakeshire Drought and the Great Ironforge Flood, caused by a portal being opened within the lake to Ironforge without a liquid filter. Gnomeregan is lost after Sicco Thermaplugg convinces Gelbin Mekkatorque to release lethal radiation in the city, irradiating not only the invading troggs but most of the gnomes as well. Mekkatorque and the gnomes are granted refuge in Ironforge by the dwarves, establishing Tinker Town. King Varian Wrynn is kidnapped. Bolvar Fordragon becomes Regent-Lord of Stormwind. "Varian" later (around the time of the end of The Burning Crusade) returns to the throne. Corrupted green dragons appear around the world from the Emerald Nightmare. The Might of Kalimdor assaults Ahn'Qiraj: The Fallen Kingdom. Open violence between the Alliance and Horde begins in Silithus and the Eastern Plaguelands. By year 25, Prince Kael'thas and his followers on Outland have captured Tempest Keep. He sent the naaru M'uru back to Quel'Thalas. The Blood Knights under Lady Liadrin are formed by Rommath. Quel'Thalas enters negotiations with the Horde. Kael'thas is informed via Rommath. By the time draenei left Outland, blood elves are already a part of the Horde. Velen leads a raid to liberate the Exodar and escape Outland. Blood elf saboteurs cause it to crash on Azeroth. The Dark Portal Opens under the command of Lord Kazzak. His forces are defeated by the Argent Dawn and Alliance and Horde forces. The latter create settlements in Outland. Tyrygosa seems to heal Malygos's insanity. A Legion counterattack fails. The Portal is briefly closed, but later reopened as Alliance and Horde take the battle to Outland. A resurrected Kael'thas and his felblood minions take M'uru to the Sunwell Plateau. Lady Liadrin and her Blood Knights join the Shattered Sun Offensive, along with the Aldor and Scryer factions. The Twilight's Hammer recruit Archbishop Benedictus to the cult. Cho'gall travels to Northrend to weaken Yogg-Saron's bindings in Ulduar. Onyxia's Lair (original): Onyxia is slain by Varian Wrynn. The Lich King Arthas reawakens and begins his campaign of conquest anew. The Scarlet Crusade moves to Northrend in the wake of devastation, forming the Scarlet Onslaught. The Argent Crusade and Knights of the Ebon Blade are formed at the Battle for Light's Hope Chapel. The Scourge begin regular attacks on Stormwind City and Orgrimmar. The war against the Lich King begins. Nexus War: The Wyrmrest Accord, the Kirin Tor, and its allies begin full-scale assaults on the Blue dragonflight and Malygos at Coldarra. The Bronze dragonflight sends heroes seven years into the past to prevent the Infinite dragonflight from interfering with the Culling of Stratholme. Alliance and Horde battle for dominance at Wintergrasp. Archavon the Stone Watcher is slain at the Vault of Archavon within Wintergrasp Fortress. Yogg-Saron is defeated. Re-origination of Azeroth at the hands of Algalon the Observer is averted. The second of the Vault of Archavon's four watchers falls, Emalon the Storm Watcher. The Argent Tournament Grounds have been completed. Highlords Tirion Fordring and Darion Mograine have the forces of Alliance, Horde, Argent Crusade, and Knights of the Ebon Blade compete to decide which champions will participate in the final assault on Icecrown Citadel. The Argent Crusade's champions are sent to aid the Sunreavers and Silver Covenant against the Kvaldir at Hrothgar's Landing. Conflict between Alliance and Horde at the Isle of Conquest. The third watcher of the Vault of Archavon falls, Koralon the Flame Watcher. The Ashen Verdict makes its final assault on Icecrown Citadel. Icecrown Citadel: The forces of the Ashen Verdict destroy the Lich King's mightiest servants. The Lich King Arthas is killed. Bolvar Fordragon is crowned the new Lich King. The final watcher of the Vault of Archavon, Toravon the Ice Watcher, is destroyed. Gelbin Mekkatorque and his gnomes retake Gnomeregan's surface. The Darkspear trolls and their allies retake Echo Isles from Zalazane. Deathwing returns to Azeroth, scarring it with a great cataclysm. The Invasion of Gilneas ceases at the Greymane Wall. Though the Forsaken lose their holdings in Gilneas, a truce halts the Gilneas Liberation Front from entering Silverpine Forest. Lady Sylvanas Windrunner is assassinated by Lord Godfrey but resurrected after Godfrey and his allies are forced to retreat. Kezan is destroyed; the Bilgewater Cartel joins the Horde. Bilgewater Harbor is built in Azshara. Trade Prince Jastor Gallywix writes his autobiography, Trade Secrets of a Trade Prince. The Defias Brotherhood is reborn under Vanessa VanCleef after roughly five years of inactivity. Twilight's Hammer agents ally with Ragnaros the Firelord at Mount Hyjal and attempt to burn down Nordrassil. Throne of the Four Winds: Al'akir is slain permanently. Conflict breaks out at Tol Barad. The demons of Baradin Hold are defeated. Wildhammer Clan rejoins Alliance; Dragonmaw Clan rejoins the Horde. Bastion of Twilight: Cho'gall and Sinestra are defeated. Blackwing Descent: The resurrected Nefarian and Onyxia are slain. The Gurubashi and Amani trolls unite under the Zandalari. Zul'Gurub: Jin'do the Godbreaker is killed. Ragnaros and his minions try to set Nordrassil to flame. Fighting breaks out within the Firelands itself. The area of Mount Hyjal that was scorched in the Second Battle of Mount Hyjal has been extinguished of flame and the forest has begun to regrow. Agents from the Firelands bypass or destroy the wards and reinvade the area. Firelands: Sulfuron Keep is sieged. Fandral Staghelm is killed as leader of the Druids of the Flame. Ragnaros the Firelord is permanently defeated in the Firelands. The final assault on Deathwing and the Twilight's Hammer begins. Well of Eternity: Agents of the Alliance and Horde are sent back 10,028 years to retrieve the Dragon Soul from the War of the Ancients. Hour of Twilight: The siege of Wyrmrest Temple. Archbishop Benedictus is revealed to be the "Twilight Father" and is killed. Dragon Soul: Deathwing is destroyed by Thrall and the Dragon Aspects at the Maelstrom using the Dragon Soul. A second cataclysm is averted. The Aspects are reduced to mortal state and the "Age of Mortals" begins. Pandaren of Shen-zin Su split into two major groups, Tushui and Huojin and join the Alliance and Horde, respectively. Anduin Wrynn is captured by the Horde but later escapes. Battle of the Serpent's Heart. The sha threat caused by the massive surge of negative energy becomes a grave danger for Pandaria and its denizens. Zandalari under the leadership of Zul, and other allied troll tribes rejoin with their ancient mogu allies and resurrect Lei Shen. The Alliance and Horde navies make landfall in the Krasarang Wilds of Pandaria. Dagger in the Dark: An assassination attempt by the Garrosh's men forces Vol'jin into hiding. Garrosh's agents raid Darnassus to sabotage Lor'themar's negotiations with the Alliance. The Purge of Dalaran: The Horde is removed from Dalaran. The [Divine Bell] is shattered. The Zandalari ally once more with a revived Lei Shen and his mogu subjects. The Kirin Tor Offensive and Sunreaver Onslaught land on the Isle of Thunder. Vol'jin returns to Durotar. The Darkspear Rebellion begins. The Alliance forms a truce with the rebels to take out Garrosh Hellscream. The rebels liberate Razor Hill. Deepwind Gorge: Alliance and Horde battle in the Valley of the Four Winds. Heart of Y'Shaarj is unearthed. Garrosh Hellscream uses the Pools of Power to revive the Heart, destroying half of the Vale of Eternal Blossoms in the process. Sha of Pride is unleashed. Most of the Kor'kron are wiped out. Garrosh is dethroned and captured, then moved to Pandaria for trial. Vol'jin replaces Garrosh as Warchief of the Horde. Garrosh Hellscream escapes from custody in Pandaria with the help of Wrathion, Kairoz, and Zaela; he is taken by Kairoz to the Draenor of Timeline B, 35 years earlier. Kairozdormu tells Garrosh that he intends for him to create the first of many new Hordes. Not wanting to be a pawn, Garrosh betrays and kills Kairoz with a shard of the [Vision of Time]. Garrosh uses the shard to convince Grom Hellscream not to drink Mannoroth's blood, and to instead create the Iron Horde. Grom rejects the demon blood, kills Mannoroth, and captures Gul'dan. The Dark Portal on Draenor in Timeline B is connected to the one on Azeroth in the present of Timeline A; The portal's glow turns from green to red, and both timelines' events run simultaneously from this point. The Iron Horde's initial invasion of Azeroth. The Ironmarch pours out of the Dark Portal and makes it all the way to Blackrock Spire, destroying Nethergarde Keep along the way. In retaliation, Khadgar assembles the champions of the Alliance and the Horde, leading them through the portal to stop the Iron Horde on Draenor once and for all. In Tanaan Jungle, Draenor's Dark Portal is destroyed by the Azerothian strike force, severing its connection. The Horde expedition arrives at Frostfire Ridge. They establish a garrison named Frostwall and help the Frostwolf Clan conquer Bladespire Citadel. The Alliance expedition ventures into Shadowmoon Valley and establish contact with the local draenei, including Timeline B's Velen. They establish a garrison named Lunarfall. Khadgar's offensive deals a crushing blow to the Iron Horde. The Frostwolves and the Horde slay Warlord Fenris of the Thunderlord Clan at Grom'gar and halt the Iron Horde's invasion during the Battle of Thunder Pass. The Draenei and the Alliance force Ner'zhul into hiding after the Dark Star is purified by Velen's sacrifice, and successfully repel the Iron Horde invading Karabor. Later on, Ner'zhul meets his end in his clan's burial grounds. Shattrath City is liberated from Iron Horde control and Blackhand is forced to escape, though not before killing Maraad and Orgrim Doomhammer during the confrontation. At some point, however, the liberated city is occupied by the Shadow Council. In Nagrand, Warlord Dharl of the Burning Blade Clan is slain at Hallvalor, followed by Garrosh Hellscream, who ultimately meets his end at Thrall's hands during the Siege of Grommashar. Later on, the Alliance, Horde and Cho'gall's pale orcs attack Highmaul, Kargath Bladefist is slain by adventurers while Imperator Mar'gok dies at Cho'gall's hands and the Gorian Empire is left crippled. Warlord Azuka, Dharl's successor, is slain in Bladefury's Command by the commanders. Inside Blackrock Foundry, adventurers defeat Blackhand once and for all. Grommash's failure breeds dissent within the ranks, affording the warlock Gul'dan the opportunity to usurp the Iron Horde and summon the demonic Burning Legion to Draenor, joined by Warlord Kilrogg of the Bleeding Hollow Clan. Gul'dan persuades the Iron Horde's remaining leaders to serve the Burning Legion, imprisons Grommash, and also recruits the aid of Shadow-Sage Iskar and the Sethekk arakkoa. Gul'dan takes control of Hellfire Citadel, intending to use it as a staging area for the Legion to invade Draenor. He then proceeds to summon the demon lord Archimonde. The heroes of Azeroth assault the citadel’s gates, invading from both land and sea. Aided by Khadgar, Yrel, Durotan and a freed Grommash, Azeroth's champions battle their way through the horrors unleashed within Hellfire Citadel. After a harrowing struggle that nearly destroys Draenor, the heroes are able to cast down Archimonde. As he falls, Archimonde hurls Gul'dan through a portal to fulfill his pact with the Legion. King Magni Bronzebeard awakens in Old Ironforge. Gul'dan re-opens the sealed portal inside the Tomb of Sargeras, beginning the Burning Legion's Third invasion of Azeroth. Khadgar warns the faction leaders of the Legion's return, then heads to Karazhan for answers. Gul'dan gains access to the Nightwell by allying with the nightborne, led by Elisande. Jarl Skovald and the Tideskorn accept the fel-gift and become Felskorn. Gul'dan also penetrates the Vault of the Wardens thanks to Cordana Felsong, steals the crystal within which Illidan's corpse was contained, and severs his body from his soul, causing the ghosts of Black Rook Hold to be brought back and crazed. The Alliance and the Horde fight the Battle for the Broken Shore. High King Varian Wrynn and Warchief Vol'jin are killed, Tirion Fordring presumably dead but survives. Sylvanas Windrunner becomes Warchief of the Horde. Anduin Wrynn becomes King of Stormwind as well as High King of the Alliance. The Burning Legion makes assassination attempts in Orgrimmar and Stormwind as the faction leaders gathered to mourn the Warchief and the High King, but the Illidari undid their plans and are as such accepted as allies among the two factions. The Legion openly launches full-scale invasions on Kalimdor and the Eastern Kingdoms. Dalaran is moved above Karazhan. Khadgar, Magni, Brann Bronzebeard and an adventurer go to Ulduar. Magni tells them to seek the Pillars of Creation. Dalaran is moved to the Broken Isles to coordinate the search for the Pillars. Dargrul the Underking betrays the Highmountain tauren by murdering Highchieftain Ulan Highmountain and stealing the [Hammer of Khaz'goroth]. The first signs of the Emerald Nightmare appear in the Emerald Dreamway. Khadgar and the class orders help Senegos fight off the Withered of Azurewing. A logbook is found indicating Sylvanas Windrunner's arrival to the Broken Isles. The class orders help Prince Farondis regain his status and undo the naga's advances led by Tidemistress Athissa. Queen Azshara makes an appearance in Azsuna before Prince Farondis, and announces the coming of her Wrath. The Wrath of Azshara is defeated and the first Pillar of Creation, the [Tidestone of Golganneth], is retrieved. The Nightmare spreads throughout Val'sharah and takes notably Cenarius, Thaon Moonclaw and Elothir. Xavius publicly returns. Ysera is corrupted and then put down. The second Pillar, the [Tear of Elune], is secured. The ghosts of Black Rook Hold are dealt with. Dargrul destroys Riverbend, home of the Rivermane tribe. The Skyhorn and the Stonedark are rallied under the Highmountain Tribe. The Bloodtotem however accept the fel-gift and become Felsworn. The coalition launches an assault on the home of the drogbar. Dargrul destroys another village. The class orders guided by Spiritwalker Ebonhorn enter Neltharion's Lair and kill Dargrul, securing the third Pillar, the [Hammer of Khaz'goroth]. The Alliance led by Genn Greymane assaults Sylvanas and the Horde. The Skyfire is destroyed. The class orders pass the different trials of the people of Stormheim and obtain the blessing of Yotnar, of the Thorignir, and of the ancient vrykul kings. The combined assault of the Legion and the Felskorn at the Gates of Valor is repelled. They finally pass Odyn's test in the Halls of Valor, kill God-King Skovald and secure the penultimate Pillar, the [Aegis of Aggramar]. At the same time, they obtain the blessing of Ashildir and are granted audience with Eyir. Sylvanas' attempt to enslave her is thwarted by Genn Greymane. Xavius is defeated within the Emerald Nightmare, purging the Emerald Dream from its influence. The Burning Legion invades the magical tower of Karazhan, seeking to turn it into a second gateway to Azeroth as they did with the Tomb of Sargeras. Khadgar and the class orders thwart the Legion's efforts, culminating the defeat of the demon leader, Viz'aduum the Watcher, with the help of Medivh. Helya is killed in her realm of Helheim during the Trial of Valor, finally freeing Prime Designate Odyn and his Valarjar army from the Halls of Valor. Alternate Gul'dan is defeated at the Nighthold and Suramar City is retaken. The Armies of Legionfall are formed. The Burning Legion summons in many Legion Ships and launches great assaults on the Broken Isles. The Legionfall attack the Broken Shore and secure Deliverance Point, Aalgen Point and Vengeance Point. Mephistroth, the mastermind behind the Legion's invasion, is defeated within the Cathedral of Eternal Night and the Aegis of Aggramar is installed, as the first Pillar to be used to seal the Tomb. Anduin Wrynn retrieves Shalamayne at the Broken Shore. Anduin: Son of the Wolf (present) : Anduin is attacked by a dreadlord in Stormwind Keep. Kil'jaeden is defeated and the Tomb of Sargeras is sealed once more using the Pillars of Creation. Illidan opens a gigantic rift between Azeroth and Argus. The citizens of Dalaran panic, the Kirin Tor tries to keep the population under control while doomsayers and disguised demons cause more unrest. The draenei launch a full assault on the Burning Legion's homeworld of Argus using their newly constructed ship, the Vindicaar. Meeting with the Army of the Light above Krokuun, the latter's ship, the Xenedar, is shot down. Velen reunites with the krokul of Krokuun. Turalyon and Alleria Windrunner are found after 22 years of absence. Krokuun is liberated, until the Army of the Light's advance is crushed by Aggramar at Nath'raxas Hold. The Army goes to Mac'Aree where they retrieve the [Sigil of Awakening] and the Crest of Knowledge. Alleria Windrunner deals with the Void threat locked away in the Seat of the Triumvirate, the dark naaru L'ura. The Army wages guerilla war with the Legion in the Antoran Wastes. The heroes of Azeroth invade Antorus, the Burning Throne, the seat of the Burning Legion's power, where they free the spirits of the imprisoned titan Pantheon and ultimately defeat the world-soul of Argus. The Pantheon imprison Sargeras at the Seat of the Pantheon, with Illidan Stormrage staying behind, but not before Sargeras impales Silithus with his sword. The Alliance and the Horde recruit allied races. Both factions crash on Nazjatar. A few quests mentioned that Cataclysm took place 6 years after World of Warcraft. However, the Ultimate Visual Guide ultimately established that the gap between World of Warcraft and Cataclysm was only 3 years. ^ Dire Maul - Game Guide - World of Warcraft. Archived from the original on 2013-12-31. ^ [The War of the Shifting Sands] "It has been nearly a thousand years since the 'War of the Shifting Sands.'" ^ World of Warcraft manual, 174. "The gnomes have not had a proper king or queen for over four hundred years." ^ Rise of the Horde: "K’ure was dying, trapped in the very vessel that it had provided when it had crashed into this world two hundred years past." (at the time of young Durotan's first meeting with Velen). ^ "Around the time of Medivh's birth on Azeroth..."
^ Miss Danna#Quotes - "the monument dedicated to the heroes of the two Great Wars"
^ "Nobundo learned shamanism in year 10." ^ Thinking with Portals - A Memorandum on Proper Portal Usage, in 24 A.D.
^ [The Path of Redemption]: The Alliance and the Horde were going to come en masse in response to a great plague that the Lich King was about to unleash upon them. ^ According to World of Warcraft: Chronicle Volume 3, the fall of Naxxramas took place before the Nexus War and Malygos' death, which in turn took place before the Battle of the Wrath Gate. 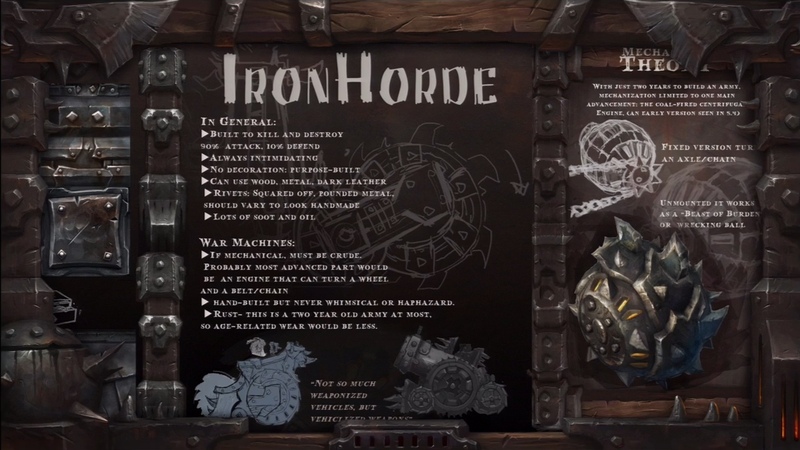 ^ BlizzCon 2013 - Iron Horde. "With just two years to build an army..." "This is a two year old army at most..."
^ Magni: Fault Lines: "Been four years since you turned to stone." Cataclysm happened in year 28. ^ Official Preview - "Taking place just prior to the first demon invasions of Legion"
^  Evidence Collection - Captain Alpert : "I haven't seen a red bandana in five years. Could this shadowy figure be attempting to reform the Defias Brotherhood?" ^  If You're Not Against Us... - Matoclaw : "A decade ago, a great battle took place here on the summit of Mount Hyjal. Archimonde the Defiler commanded a swarm of demons to march upon the World Tree and claim its power for his own."